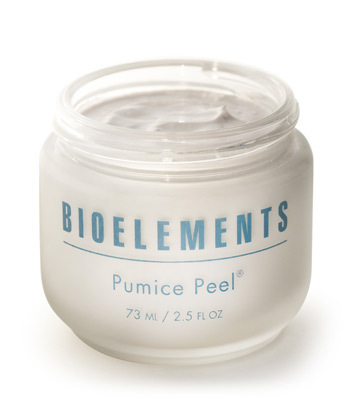 Ultra-fine pumice crystals peel-away dull, dreary cells, abrade uneven skin and visibly reduce the appearance of pores. Youthful texture is restored and a healthy glow returns as skin takes on a polished, poreless look. Plus you get the added benefits of nourishing plant extracts and essential oils to soothe, smooth and comfort your complexion. I have been using the Pumice Peel 2-3 times per week for several years now and still love it as much as I did on day 1. It does an excellent job of exfoiliaing dead skin while the fine grains make it gentle. Have been using this product for several years. Does a good job of sloughing off dead skin cells and leaving face soft and smooth. I like that the pumice grains are very fine. Use about twice a week. A little goes a long way so one jar lasts for a long time. I use this 2 - 3 times per week. The Pumice Peel removes the top layer of dead skin and leaves my face feeling smooth and clean--providing a perfect palette for moisturizer and makeup. Fantastic! Skin is glowing, healthy, pores tight after one use! Apply an ample amount over clean, moist skin avoiding the eye area. Gently massage over skin for one minute and rinse off thoroughly. Use this exfoliating facial peel once or twice a week as needed.